It was here that Periazhwar sang "Tirupallandu" (the first Dasakam of Periazhwar Tirumozhi) offering Mangalasasanam for the Lord, His Consorts, His Ayudhas(weapons), other Ornaments and His devotees. One can see the ashtanga vimanam from a higher level in the temple, where the Lord gives darshan as Pallikonda Perumal (Sayana) and Suryanarayana in standing posture which are immensely beautiful. As per Sthalapuarna, once heavy rain and floods created a big structure preventing further rain. Since the clouds joined together, the place is called Tirukoodal (koodal - to meet). Thaayaar - Madhuravalli Naachiyaar (Vagulavalli, Varagunavalli, Maragadavalli). 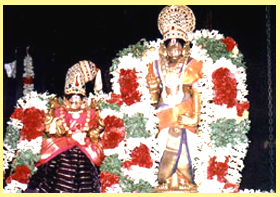 Theertham - Hemapushkarini, Chakra Theertham, Krudamaalaa river, Vaigai river. Access to the temple Very near to Madurai. Being a zilla headquarters, it has a well established transportation. The Moolvar found in this Sthalam is Koodal Azhagar. Moolavar in Veetrirundha thriukkolam facing his thriumugham in East direction. Prathyaksham for Brighu maharishi, Sownaka maharishi and Periyalwar. This sthalam is situated in Madurai district in Madurai, Tamil Nadu. The temple is found close to Madurai main Bus stop. Plenty of bus, train facilities are available. Lots of lodging facilities are also available. The travel to this divyadesam is very easy since lots of transportation facility is available.